Our company’s Mission is simply to help our members save money each and every time you log on to the internet to make an online purchase. The internet continues to evolve at record speeds. We are bombarded each and every day with commercials and advertisements providing us with limited time savings, deals and offers from companies all over the world trying to entice us to come to their websites and buy from them. We feel strongly that we are no longer in the “Information Age”, but rather the “Information Overload Age”! So, our Mission is to help simplify the process for our members so you can have a central access point and company you can turn to that will help you take advantage of the large array of brand name company savings that are available across the web. Our company founders are internet industry veterans who are very knowledgeable in where and how to find the best money saving deals the internet has to offer. Before goldclubdiscounts.com came to fruition, many of our family and friends were coming to us for advice as to how and where they can get access to online savings from many of their favorite online stores & companies. Very quickly word travelled fast about the savings we were able to help provide access to. Before we knew it, we had countless numbers of people coming to us from all parts of the country seeking our guidance. This is when we took a step back and said, wait a second, why don’t we start a company whose sole purpose is to help people find the best deals on the web and save $ each and every time they look to make an online purchase? The idea seemed almost too simple at first, but like most things in life, we found that keeping it simple works the best. So, goldclubdiscounts.com was born. 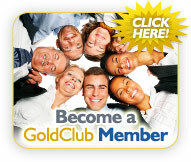 To learn more about our company & our Gold Club Discounts membership program, please click here.